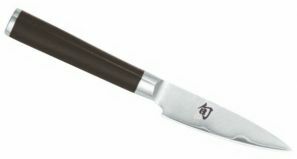 The Shun chef's knife series is one of the world's most extensive knife series made of damask steel. It is well received among the cooking elite and ambitious hobby chefs. Shun professional chef's knives are made from a newly developed stainless damask steel with 32 layers. The inner layer is made from V-gold-10 steel. This steel is highly resistant to corrosion, extremely hard (61?1 HRC, 1.0% carbon, 1.5% cobalt) and the reason for the blade being incomparably and lastingly sharp. The convex blade profile in combination with the hand honing of each Shun knife makes for an unrivalled sharpness that allows the knife to glide softly through even the toughest foodstuffs. Paired with the knife's well-balanced weight this sharpness allows for non-fatigue work. You must be 18 years or older to purhase these knives.